I know what you are thinking- “OH NO, not another PSL hack- Jeny, haven’t you seen all of the recipes online? 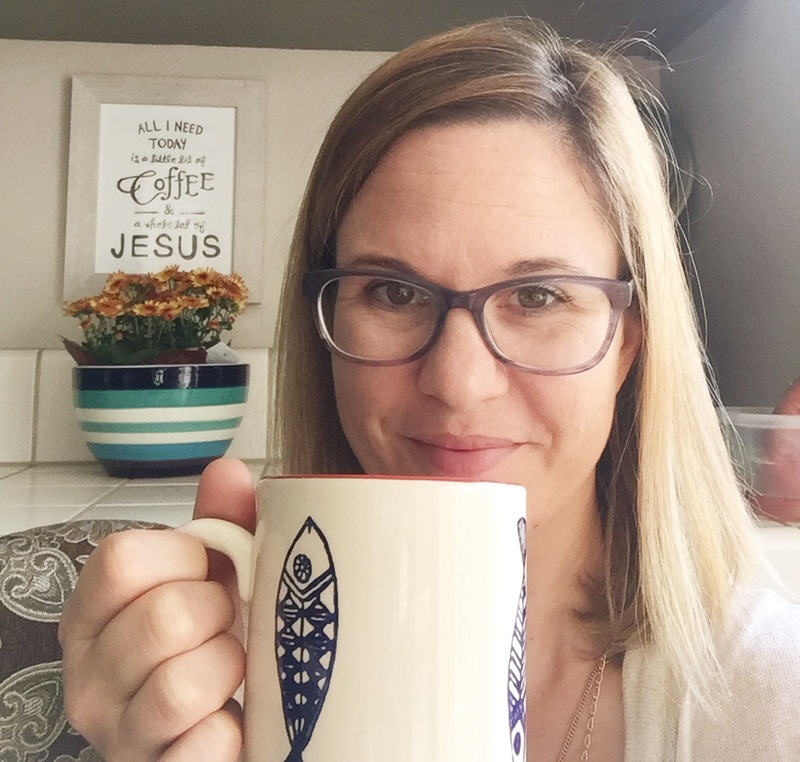 !” Oh YES, I have definitely seen all those “hacks” floating around out there that boast they are just as good or even better than Starbucks most famous coffee drink: the Pumpkin Spice Latte. I’ve even tried a handful of them myself, and unfortunately every time I attempted to make the “recipe”, my DIY PSL always came out tasting unsatisfactory. I honestly think it’s because all of these recipes called for actual pumpkin purée. Yeah, it makes sense, pumpkin purée for pumpkin spice. But for me, something always tasted a little off. It just wasn’t the same at all! But hey, at almost $5 for a cup of “specialty” coffee, I don’t blame those people for trying a dupe. Seriously! $5 for ONE cup of coffee!? Pocketbook Ouch! I must admit I have been totally guilty of indulging in one or two (a week) of the delicious PSL treats when the season comes around. I have been an AVID fan since I discovered that warm, sweet, cinnamon-y, concoction years ago. My friends have even told me that my “signature scent” is pumpkin spice. Hey, I’m totally okay with that! 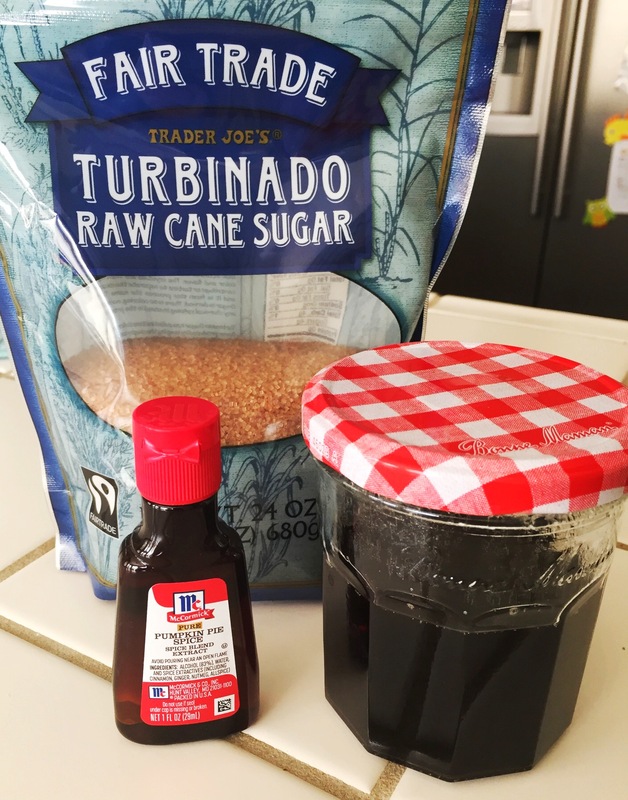 It takes less than 10 mins to make, and the simple syrup will last in your refridgerator for at least a week- depending on how often you use it! So I am excited to share this incredibly simple recipe with you, and I sure hope you enjoy it as much as I do! In a small sauce pan mix your water and sugar together. On a stove, over med-high heat bring the water/sugar mixture to a boil and boil until all the sugar has fully dissolved. Once the sugar has dissolved, remove from heat and stir in your Pumpkin Pie Spice Extract. Allow to cool before pouring it into an air tight container for storage. Once your Pumpkin Spice Simple Syrup has been made, it’s ready for some coffee! Brew your favorite coffee at home, and pour into your favorite coffee cup- then add 1-2 Tablespoons of your Pumpkin Spice Simple Syrup (or however much you want) into your cup. It also tastes great with a splash of milk, and a sprinkle of Pumpkin Pie Spice on top! No go enjoy your very own Pumpkin Spice Coffee! It felt like the perfect piece to add to our still (mostly) blank walls. Especially now for fall! So, when I finally decided to purchase it, I was bummed to find that the size of the sign was only 10″x 7.5″ (that is just too small for me). I wanted a big statement piece for the mantle! So I thought to myself, why don’t I try to make it? YES! I’d like to preface that I put my salvaged wood scraps together months and months ago. Then my blank wood sign sat unfinished until we moved into our *new* home, and we were happily reunited. I also covered all my surfaces with a protective cover- hence the Halloween & dinosaur table cloths! Next, I found a font that I liked that was similar to the one used in the “Pinspiration” photo. (The font I used is called “Moonflower” and I sized it around 750pt-so 2 letters fit per page). Then I measured the size of my sign (appx. 29.5″ x 16″), and printed out my letters. 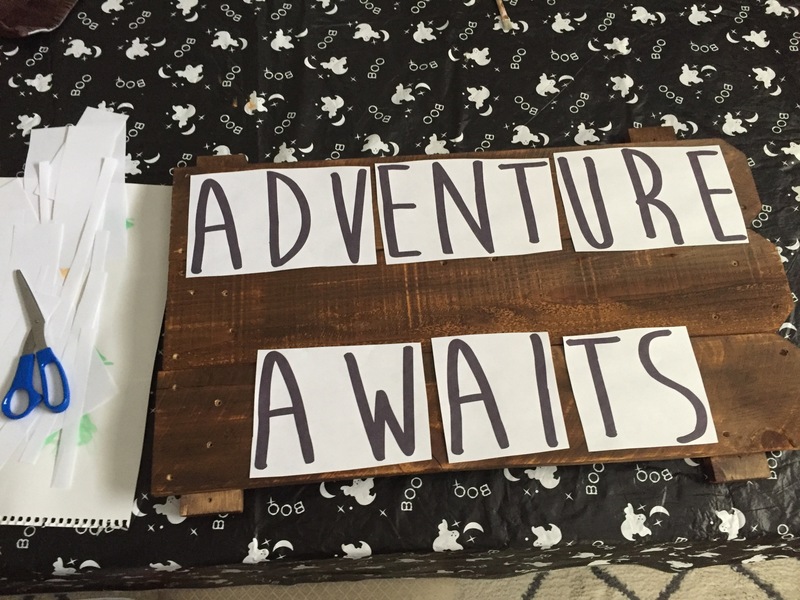 To be honest, finding the right font size for my sign took a little trial and error. I ended up printing out a handful of different sizes before I found the exact fit for my board size. I also used Adobe Illustrator, which made it easier to resize in my opinion, but you can use Word or Pages as well. 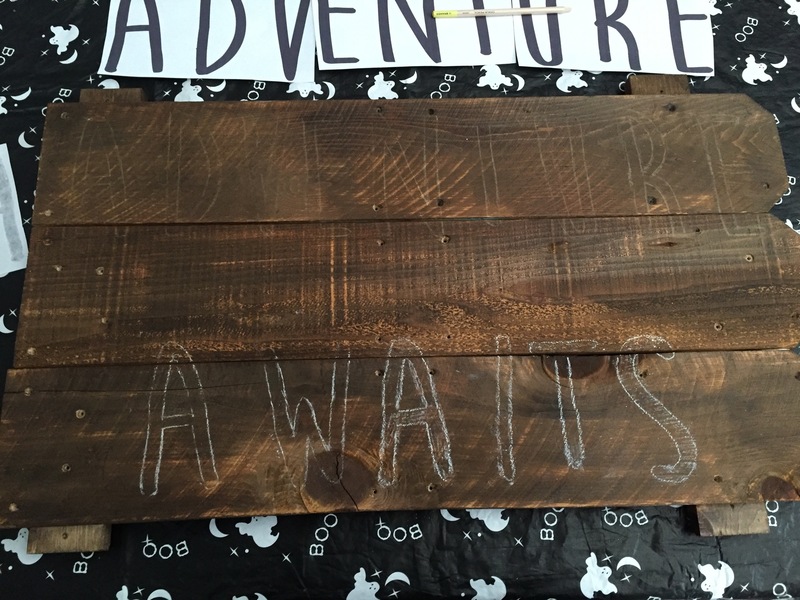 After my wood stain had dried and set, I traced and filled in the back (wrong) side of the letters/paper with a piece of chalk. I then flipped the paper over so the right side was facing up and positioned it on the wood where I wanted the text to be. 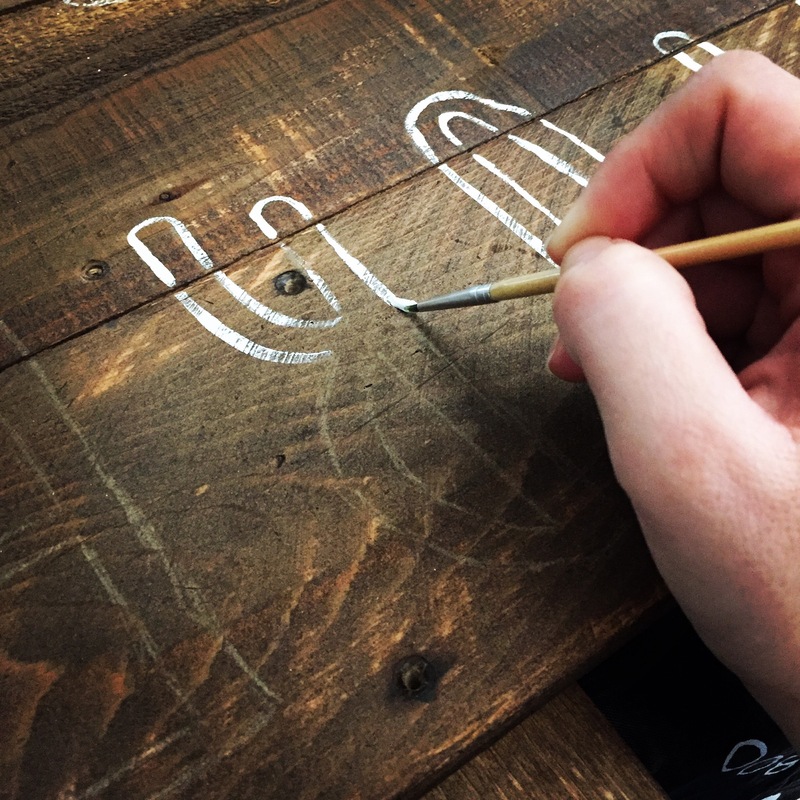 Next, I took the non bristled end of my paint brush and traced/rubbed along the letter to transfer the chalk to the board. You can use any thing with a hard tip to do this, like a pen or pencil. 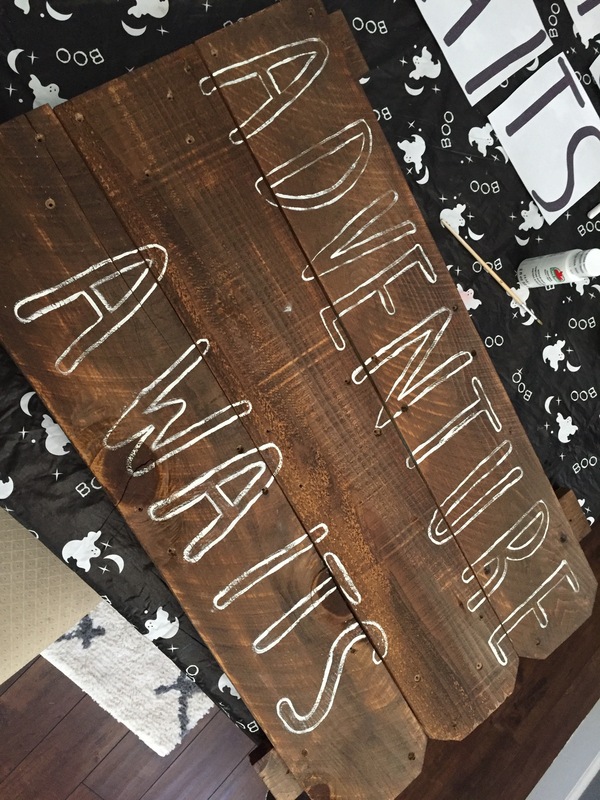 Once I had transferred all of my letters to the wood, I used an acrylic craft paint in white to trace the outline of the letters. Once the outline was dry, I painted in the letters. I didn’t try to make it perfect and completely filled in, I liked that it looked a little worn and rustic. 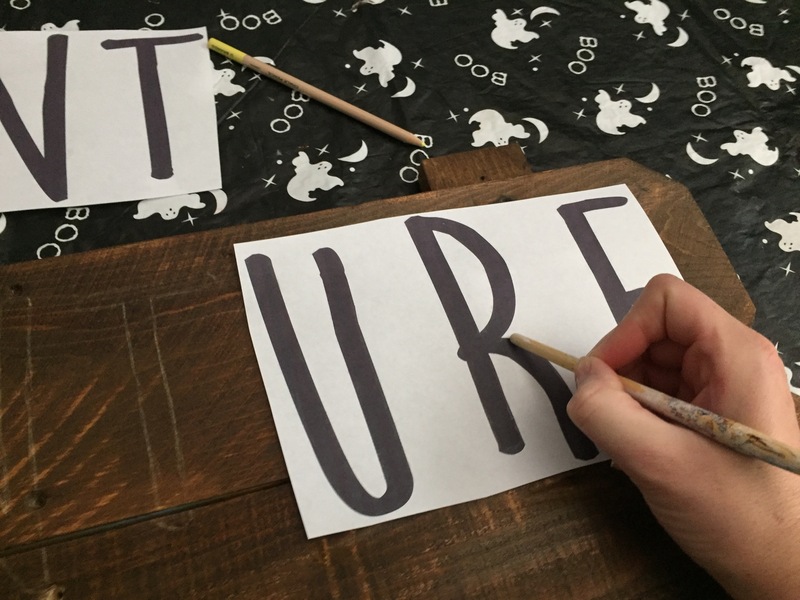 When the letters were fully dry, I drew out an arrow (with chalk) in the center with a ruler, and then painted on top of it with the white paint. 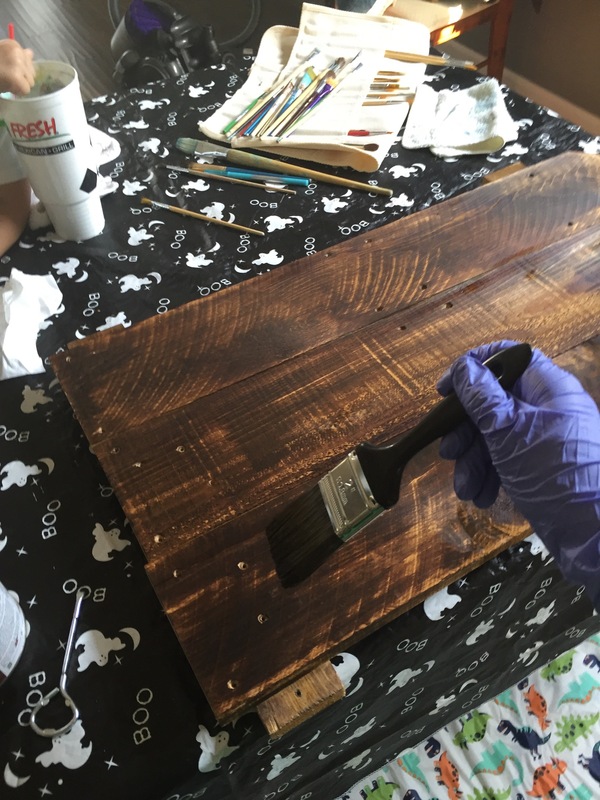 Finally, I allowed the paint dry completely and then I used a couple of layers of a Multi Purpose Sealer on top to seal and protect it. 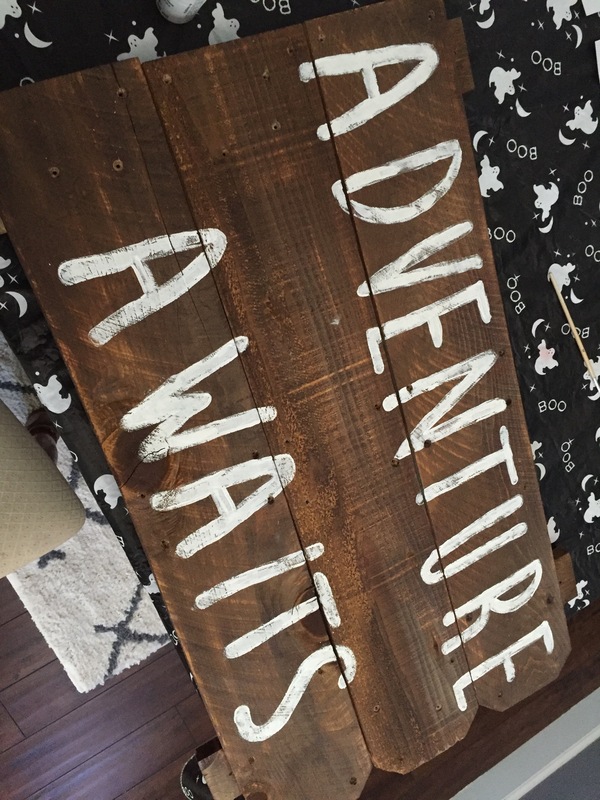 I’m totally loving my gorgeous Adventure Awaits sign. 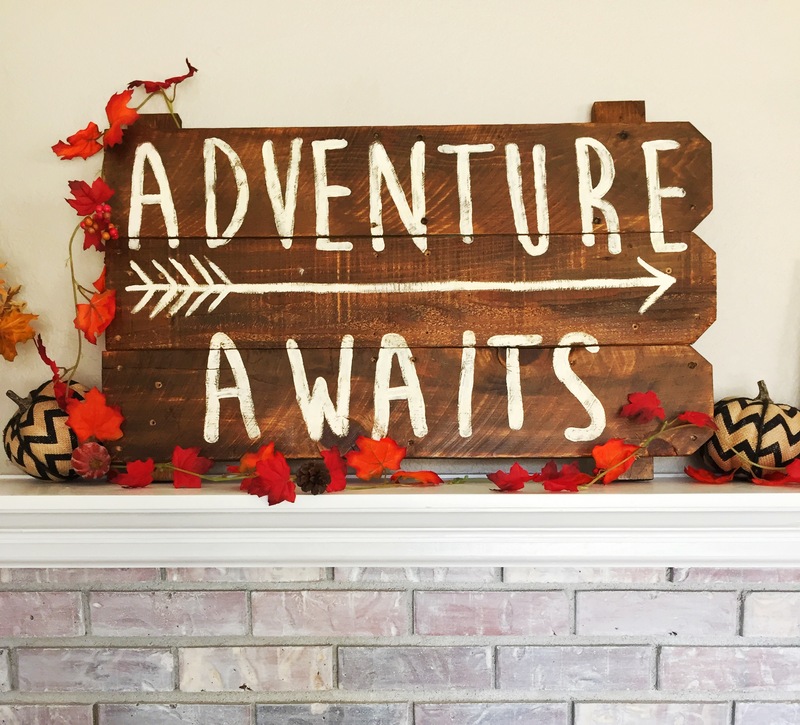 This is most definitely one of my favorite DIY projects to date, not only because it is a great statement piece for fall rustic decor, but I love the message it evokes! It reminds me of the quote “Every great journey begins with a single step” (by Lao Tze). 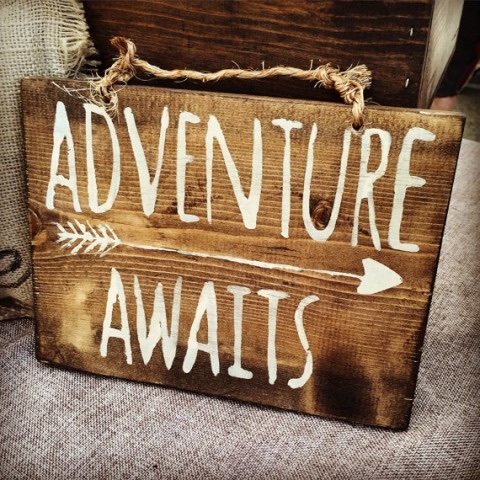 I truly feel each day that we are blessed with is the opportunity for an amazing adventure, and that journey begins with a single step. 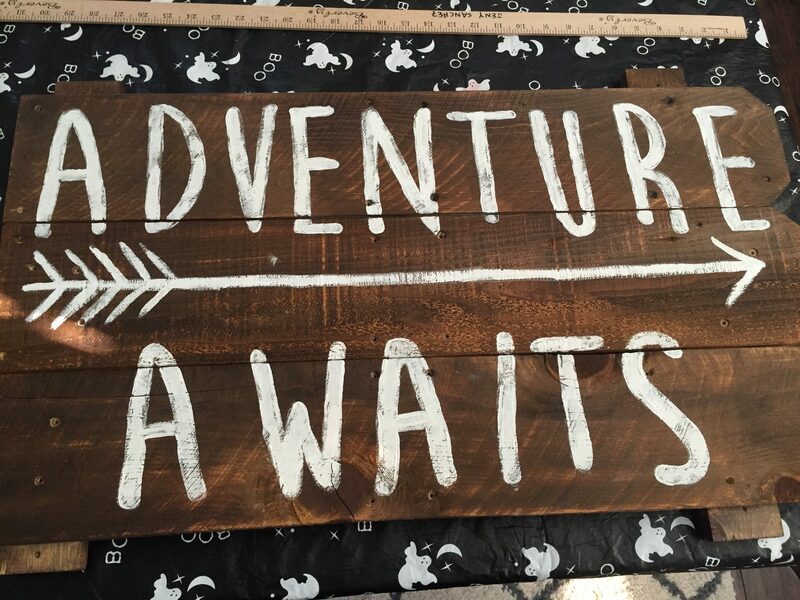 My sign was definitely fated to become a constant reminder of this amazing journey in life that we are on, AND that our own “Adventure Awaits” us just outside our own front door!